Now you'll open the start file and begin the lesson by using Quick Mask mode to convert a selection border into a temporary mask. Later, you will convert this temporary quick mask back into a selection border. Unless you save a quick mask as a more permanent alpha channel mask, the temporary mask will be discarded once it is converted to a selection. You'll begin by making a partial selection of the egret using the magic wand tool, and then you'll edit the selection using a quick mask. 1 Choose File > Open, and open the file 06Start.psd from the Lessons/Lesson06 folder. 3 In the tool options bar, enter 12 in the Tolerance text box. 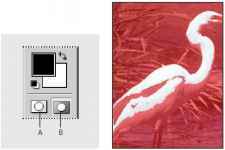 4 Click anywhere in the white area of the egret to begin the selection process. 5 To extend the selection, hold down Shift and click the magic wand on another white portion of the egret. When you hold down Shift, a plus sign appears next to the magic wand tool. This indicates that the tool is adding to the selection. The egret is still only partly selected. Now you'll add to this selection using a quick mask. 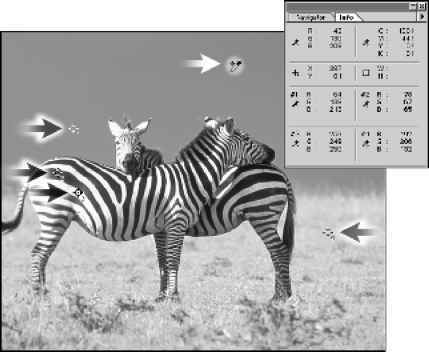 6 Select the Quick Mask mode button (J) in the toolbox. By default, you have been working in Standard mode. Note: A partial selection must exist to see the overlay color in Quick Mask mode.